Even in the exit planning process. 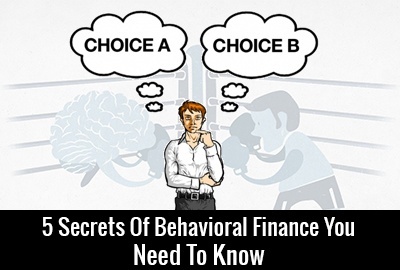 When you look at the term behavioral finance I bet you’re thinking about investments. In many cases you would be correct in thinking this.Behavioral finance also has some really good applications when it comes to selling your business. Here are a few for you to consider. Don’t count your money before it’s in the bank. You’ve decided to sell your business. You have an offer and you’ve just received a letter of intent. You might think that it’s only a matter of time before you can start counting your money. Hold on…..don’t start counting just yet. The money isn’t in the bank and you haven’t come close to crossing the finish line. You’ve still got due diligence and the final legal work….much less making sure the buyer has the money before you’re done. We tend to think that way just because we’re on the way to having a completed transaction. Don’t think like that. Celebrate when the check has cleared and you’ve been totally paid. Don’t emphasize the good over the bad. We often put more emphasize on good things that are going to happen and don’t put much effort into considering bad things that might happen. When it comes to selling your business, this is especially true. Too often you’ll think that every step towards a completed sale is confirmation that sale will go through just as you planned. We also don’t think that bad things like the buyer wanting to change the deal won’t happen. This might be one of the reasons that getting through a successful due diligence process is so difficult. We don’t want to think about bad things that could happen, so we focus on the good instead. During the sales process you’re going to have what appears to be good and bad things happen. It’s going to be hard, but you need to not get too excited or too depressed. If you’re able to do this, your sales process will be much smoother. Remember that you always have to be able to stop the process. You’re going to put a lot of effort into selling your business. The more effort you put in, the harder it will be for you to stop the whole thing. This is called sunk costs. You want to be able to stop and either put your business back on the market or just stop the entire sales process all together. It’s a really hard thing for you to say “stop.” At the same time, if you don’t do this when you it’s important, you might regret selling your business. I want you to think about having a stop number in mind. If your sales price ends up going below this price, you need to stop the process and either start over or go back to running your business. It’s why you need to make sure stay focused on keeping your company healthy while you’re trying to sell it. Make sure you have neutral advice. Almost everyone who’s involved in selling your business will be carrying emotional baggage. You want to have someone on your team who won’t have emotional or financial reasons to either keep the transaction going or call a stop to it. Here are some people who could want a failed transaction - your CPA because they lose an account, your business attorney, key employees in the company. Then there are those who want a deal to go through because they’ll get paid. The person who’s helping you sell your business falls into this category. Make sure that those who are advising you are doing so from a neutral stance. Otherwise, they’re advice will be tainted. In the end, you’re a human, not an econ. You and the people advising you are not econ’s. You, the buyer and your advisory team are not fully rational…..that’s what an econ is, a totally rational human being. Instead, you’re a human. You have feelings and can be swayed by things the affect your thinking and feeling process. Know how to manage your feelings or have someone help you do this. It just might keep you from making a huge mistake in the largest transaction of your life. Why don’t you click here and send me an email with what you’re fears and hopes are about leaving your business. I would love to hear what you’re thinking.